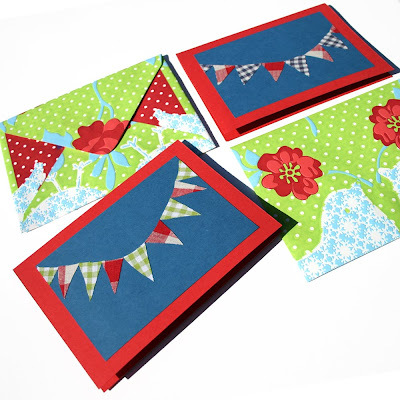 Paperfection's Art & Craft: New: Cards with Colourful Buntings! Happy to finally list new items in the shop: cards with little buntings! These are definitely faster to make than books, and fun too! The only thing was: I couldn't find the right size envelopes anywhere in town or in my fairly large supplies. So, I just made a couple from wallpaper. They combine quite well with the cards, don't you think? Yes, true, you can salvage anything, really! The fun begins when you put everything together.. Better than any envelope you would have found in a store! I am giving you a Beautiful Blogger Awared. Hope you like it. gorgeous! i love the choice of colours and motifs. just perfect!